Professional script of the Exchange of mobile (VAP) traffic. Made personally by me on my engine, the design is unique, designed to order for 80,000 rubles. The customer gave permission for the resale of the system, as he closed the project and started working in a completely different direction. 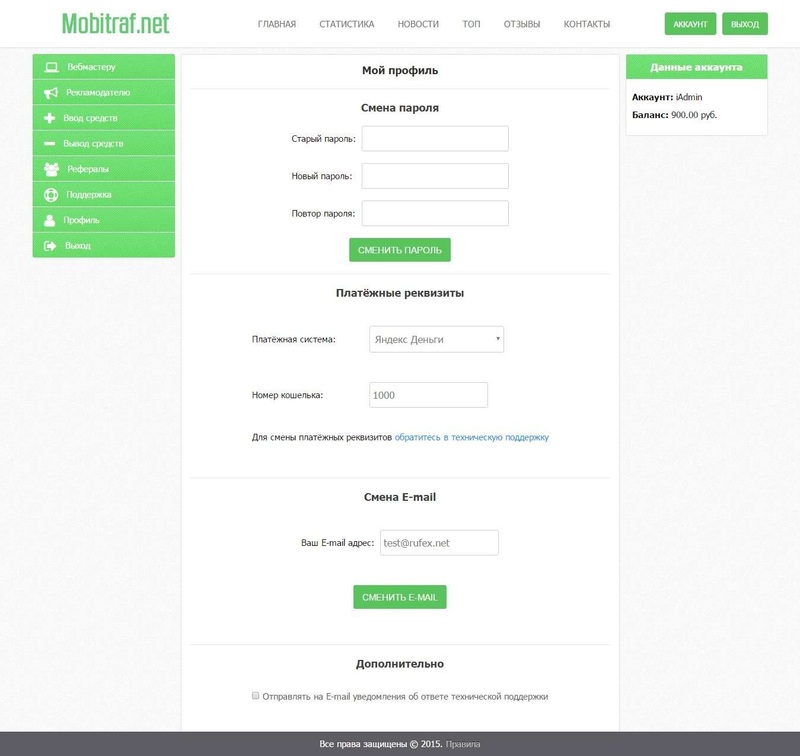 The essence of the script is that it allows participants to sell and buy mobile traffic, that is, the webmaster installs the system code on his site and users who visit his site from a mobile device are redirected to the advertiser´s site. Profit system is in the form of a percentage for each transition. Here are some features of the script. - Convenient addition of sites with confirmation of rights through the placement of a text file at the root of the web resource being added. - Many operations on the site - installation of BackUrl, editing, deletion, detailed statistics for each transition and much more. 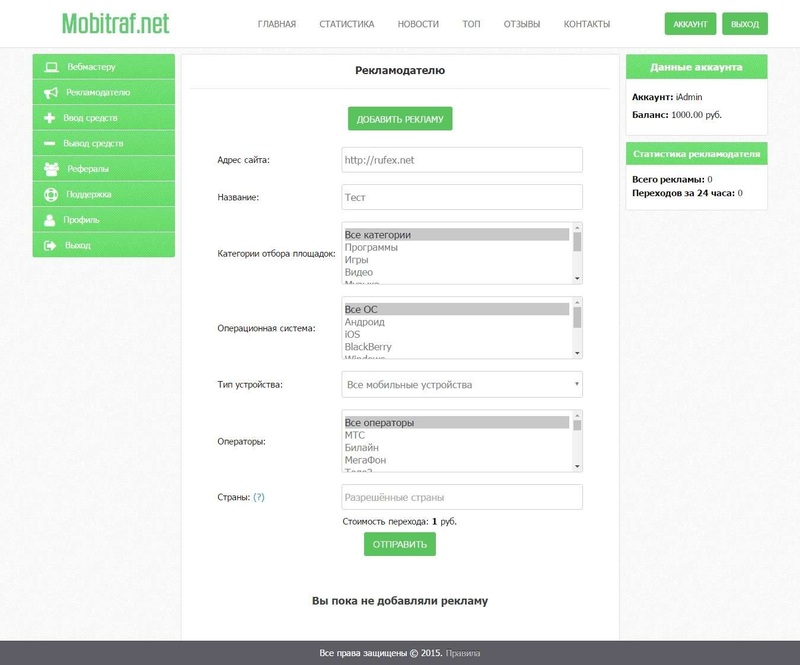 - Adding ads with powerful filtering to the categories of sites on which the redirection will take place, for operating systems (Android, iOS, BlackBerry, Windows, Java and others), by type of mobile device (phone, tablet), by operators (MTS, Beeline, Megafon, TELE2 and others), targeting by country. When selecting options, there is an extra charge for the cost of the transition (installed in the admin panel). - Detailed statistics for each transition from the advertiser. - Dynamic right menu, depending on the partition on which the user is located. - Automatic receipt of funds. Payeer payment system is used. You can connect any other. - A two-level referral system for more user motivation. - A modern convenient ticketing system for communicating users with the administrator. 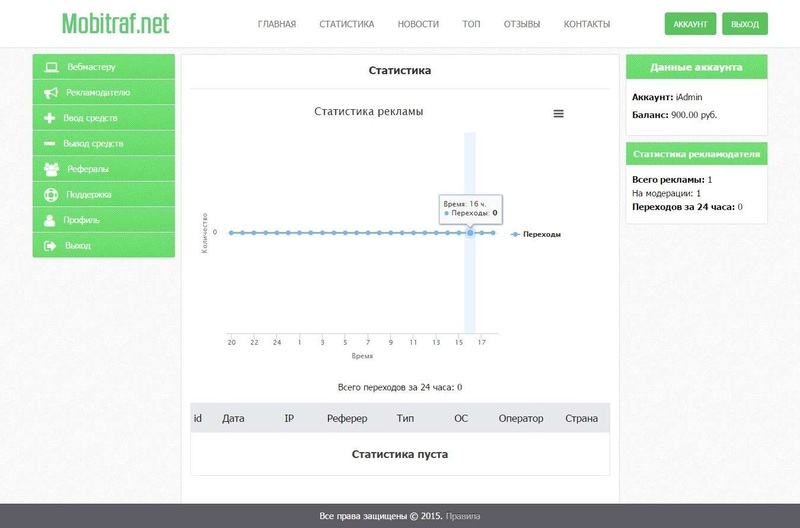 - Clear profile and the entire interface of the project as a whole. - Simply smart lending on the main page. - Admin, which allows you to control the entire system. - Project news, which are written in the control panel. - Top of the best users to enhance motivation. - Statistics on the project, available to unauthorized users. - Fully open and convenient source code on a unique personal developed by me engine (programming experience more than 10 years). A unique modern script for the purchase and sale of mobile traffic for serious work in this area. Base and installation instructions are present. It´s no secret that the search engines pessimize the sites for the currently popular Wap-Click. An excellent alternative to it can serve this script with white methods of conducting advertising campaigns, detailed reporting, protection from fraud and all the necessary opportunities for working in this industry on a professional basis.